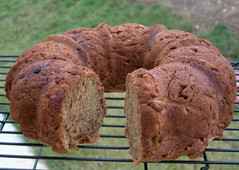 This recipe is hard to ruin, and it can be made in any shape - 9x13, 2 loaf pans, muffin sized, or bundt. It is moist and delicious! To me, fall means apple cake, and I've had it every year as long as I can remember. Mix apples and sugar. Add oil, nuts, eggs, and vanilla. Mix together dry ingredients and add. Pour into greased 9x13 pan. Bake at 350 degrees for 1 hour or until baked in center. For a luxury version of this cake, you can try baking it in two 9" pans and icing with cream cheese frosting; or serve in wedges with butter pecan icecream, drizzled with hot caramel sauce. 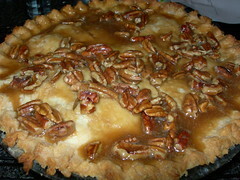 This recipe is from the Almost Home Tearoom in Greencastle, IN, where I used to make desserts. Today I used a combo of braeburn and golden delicious apples, and was quite pleased with the results. Seal, flute, and slit top to vent. Bake at 425 degrees 40-45 minutes until golden brown. Bring to a boil and boil one minute. Stir in: 1/2 cup chopped pecans. I'm going to share my grandma's recipe for pie crust. 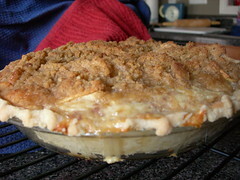 To me, this is what pie crust should taste like, because all the pies I had growing up used this recipe! One year my Grandpa was in the hospital and I spent two days with my Grandma baking for the holidays. After that, my Mom told me that pie baking skips a generation and it was always my job growing up. I know this recipe calls for shortening - the good news is that Crisco now makes a version with 0 trans fat. I read the reviews, and it is slightly less flaky than regular Crisco (and I would agree with this after using it) but to me, worth the difference in content. You can use half shortening and half butter, but the crust might burn more easily. And of course you could use half lard, but really, who wants pie crust made out of lard. Mix flour, salt and baking powder in a large bowl. Cut in shortening until evenly distributed (mixture will be crumbly). Beat egg in 1 cup measuring cup; add vinegar. Fill to 1 cup with ice-cold water. Mix. 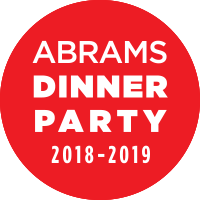 Add to above with fork. 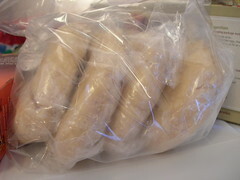 Use as directed in pie recipes, or divide dough into 6 portions and store in freezer, double-wrapped. I tried this recipe from Sinfully Vegan. Without eggs and butter, the process entailed mixing brown sugar with oil, and ground flaxseed with apple cider. The cake tastes a little too "healthfood store" for me, and I'm not sure if the culprit is the flaxseed or the whole wheat flour. I did like the concept of shredding the apples, although I would have expected a moister final product. I used an ancient bundt pan that I found at a random garage sale. Best 50 cents I've ever spent! While in North Carolina, we stopped at SkyTop Orchard. I had seen the signs before, but didn't know just how far up we would have to drive until we did it. I wish the road was better. I decided to purchase mutsu apples for baking, from that very orchard. Mutsu is a mix between Golden Delicious and Granny Smith, so I thought it might hold up nice in a pie. This recipe is from Almost Home Tearoom in Greencastle, Indiana, where I worked for over a year, making desserts. At first appearance it looks like a typical stresel-topped apple pie, but it also has a sweet custard surrounding the apples. The link to the tearoom also includes information on purchasing their cookbook. I wanted to make something that wasn't "just" an apple pie. The crust is a modified version from the typical shortening recipe - I decided to use half butter for better flavor, and kept the crust coverered with tinfoil until the last 10 minutes of the baking process. The mutsu apples definitely held their shape while baking - in fact after over an hour of baking time in the oven they were still slightly firm. Almost too firm. I still have more to experiment with. 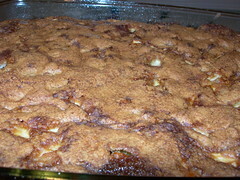 If you have a favorite apple recipe, send me an e-mail! I'd love to hear from you. I've decided to start blogging about bakeries I visit in addition to my own creations. Yesterday my husband and I drove to two bakeries in North Carolina. The first one was the Wildflour Bakery in Saluda. For a tiny town in the mountains, this bakery was a busy place! We stood in line for 15-20 minutes. They had a nice lunch menu but we decided to just buy cookies and bread. We tried a ginger cookie (crunchy on the outside and chewy on the inside), a mocha cookie, and each had what they called a Carolina Dandy - a butterscotch pecan oatmeal cookie. The bread we brought home didn't look all that appetizing really - we got the oatmeal raisin - but had really good flavor and texture. Even more impressive to me was the variety of options for wheat-free and sugar-free clients - spelt cookies and breads, sugar-free breakfast bars, etc. 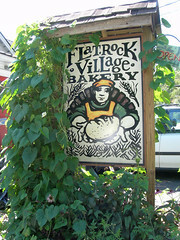 About 15 minutes away was the Flat Rock Village Bakery in Flat Rock, NC, behind The Wrinkled Egg. I had been there before for amazing woodfired pizza, and this trip didn't disappoint. 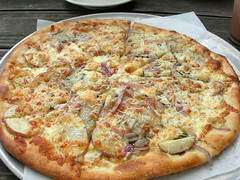 We tried the daily special which was a roasted red potato, red onion, fresh rosemary, olive oil, and gorgonzola cheese pizza. This bakery was equally busy but the service was quite a bit faster. We also purchased scones and croissants for the next day's breakfast (the winner in what I tried was the apricot cranberry!). The bread they carry is more of the artisan type compared to Wildflour, with the rounder loaves and chewier crusts.